This is a common repair, but one which should be tended to right away before water intrusion rapidly deteriorates the blade further. If you know how the blade was damaged, most of the mystery is solved as how to best prevent its recurrence. It becomes a question of whether the wood was damaged by some accident or checked. Checking is a natural opening of the fibers usually along the grain. It can, however, start following one grain and make an irregular diagonal jump to follow another grain depending on the forces working on the wood. Checking usually occurs because the wood was not completely seasoned, and is now contracting, or because of weathering from not being properly protected from the elements. In something as thin as a paddle blade, the check will normally be evident on both sides of the blade. A 4 1/2" crack that split the wood and varnish. 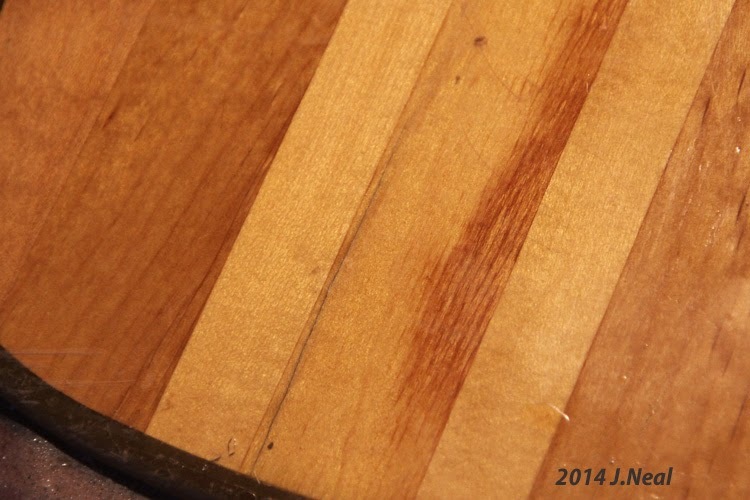 The blade is cracked when an external force is applied, the wood is bent, and the fibers on the convex side of the bend are unable to endure, and a crack occurs there first along the fibers. Initially, the crack may only be visible on what was the convex side, but, of course, if the force continues, the wood will fail completely. My paddle blade only showed a crack on one side, splitting both the varnish and the wood, but not being evident at all on the other side. We don’t know how it happened, but apparently pressure caught the blade in an unsupported position and flexed the blade. 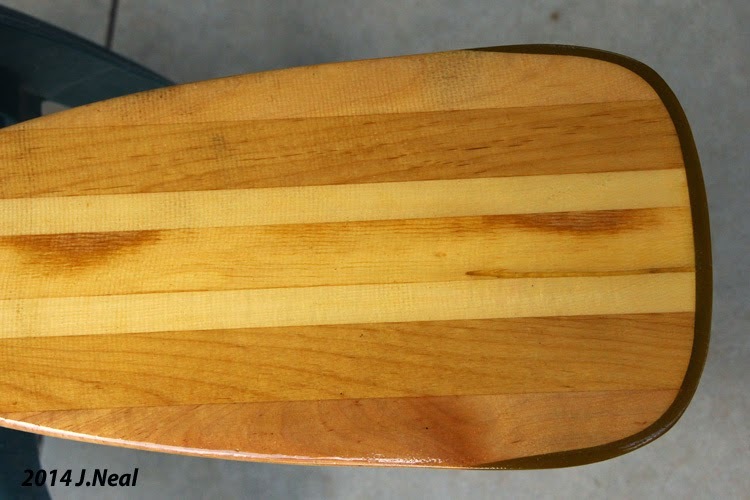 On plain paddles, the crack would normally go all the way to the end of the blade, since the wood is diminishing in both thickness and strength as the blade tapers. To start, I carefully highlight the crack with a pencil so it is easier to follow while sawing. 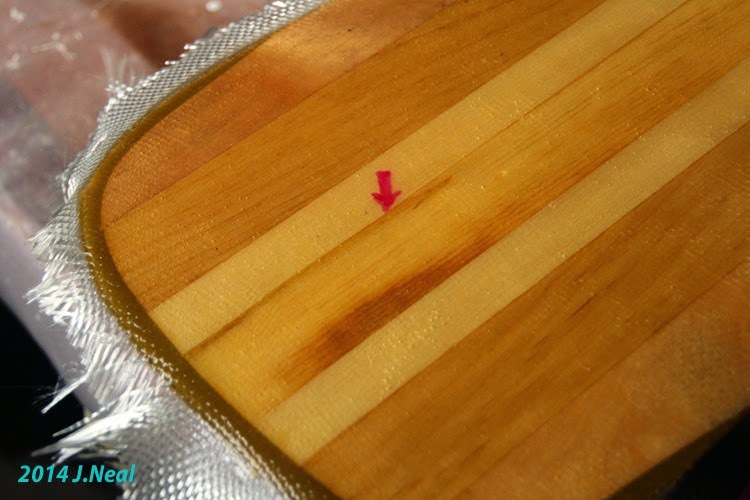 The crack is sawed through to remove any broken wood fibers, and also to open the crack enough to effect a repair. I use a saw blade just wide enough to remove the damaged fibers and no more. 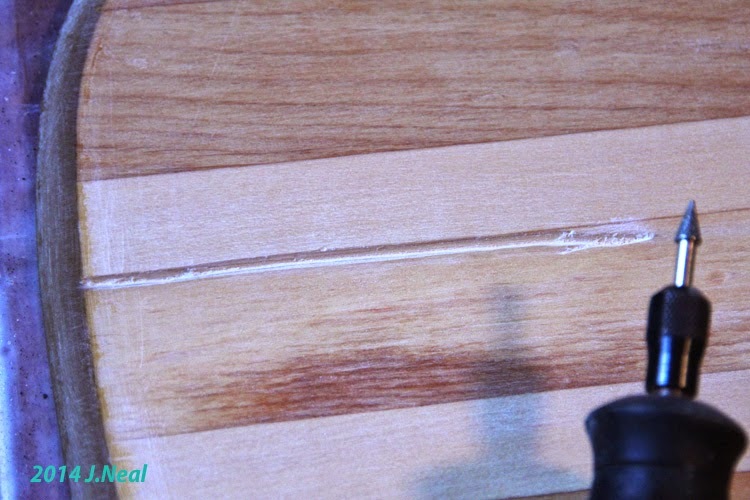 Scotch tape is applied over the crack on one side, since epoxy won’t adhere to it, and slightly thickened epoxy is then forcibly brushed into the crack to remove all air. As described below, masking tape is put on either side of the crack on the working side of the blade. On this blade, a Bending Branches BB Special Bent-Shaft paddle, the RockGard epoxy edge that is applied around most of the blade’s edge, protected the blade and kept the crack from running all the way to the end. Since the blade was not cracked through, nor to the end of the blade, I routed a “V” groove about half-way through the blade. Masking tape was used to outline the crack both in width and length. This does two things---it greatly minimizes mess and the sanding time required later, and since epoxy shrinks a bit as it cures, it allows the epoxy to stand a bit above the surface of the paddle. This makes it unnecessary to come back and add a touch more epoxy later. Once the epoxy becomes tacky, so it will no longer run, the masking tape is removed. Don’t let the epoxy cure with the tape in place. Other than varnishing, this is really all that is necessary. However, I have a long history of always wanting to do something extra. This habit has gone on long enough that it is now impossible to ignore. So, I applied a single layer of epoxy and fiberglass to cover the entire back of the blade. I doubt the materials required added as much as an ounce to the weight of the blade, but backed up the repair and strengthened the blade so that I can now either paddle with it or use it to dig trenches. Once everything is sanded smooth, just apply as many coats of varnish (minimum of four) as your patience will allow.